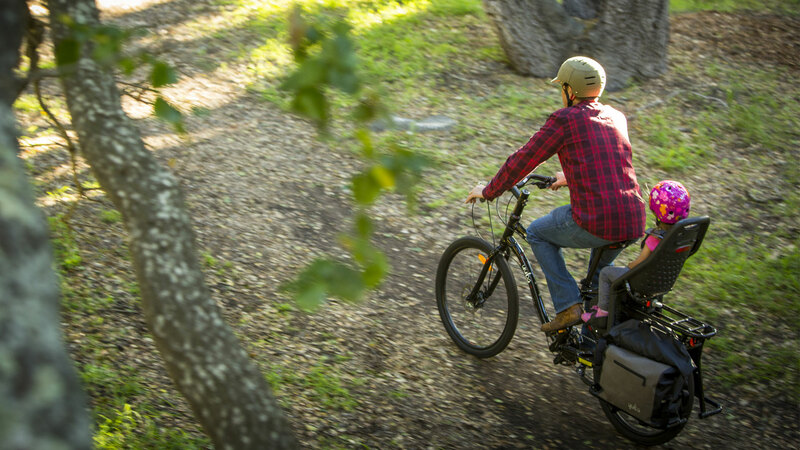 The Boda Boda All-Terrain is Yuba’s first designated off-road cargo bike, built mission-ready. Its stealthy attitude and solid-built frame allow you to take anything and anyone with you. 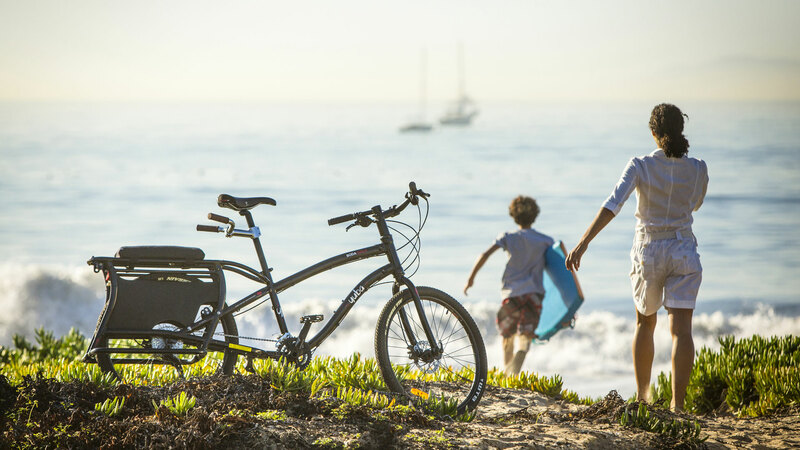 With hydraulic disc brakes, beefed up components and sturdy integrated rear rack, there’s almost no limit what this cargo bike can do. And, it comes in Special Ops Black—only! This bomber cargo bike is outfitted with knobby WTB tires and grips for extra traction on the trail, paired with ultra durable rims and sleek saddle for the road. I have had the Boda Boda All-Terrain now for about 3 months. In this time I have added monkey bars, foot pegs and a breadbasket. I have 4 children and my youngest are 5 year old twins. In the past it has always been divide and conquer on long distance bike rides because there is no way the twins could keep up on their bikes with my older 2. Now with this bike, we can travel as a family on bike rides. One of the biggest benefits I have seen is that I get soooooo much more quality time with my kids, especially the twins. I routinely take them on 20 mile rides and we talk, make jokes, look for turtles, and just connect in a way that doesn’t happen anywhere else. Now that school has started and the youngest are in kindergarten, they get dropped off in style on the All-Terrain any day that is not raining (and maybe a few that were raining just slightly, just don’t tell mom…shhhh). The school staff even took a picture of us on the first day and posted it on their weekly newsletter. I honestly put in 50-75 miles/week with an extra 100 lbs of children on the back. I take it to the grocery store and truly anywhere locally that I used to drive. I’ve lost weight and feel great. Thank you Yuba Bikes, this thing is a game changer…..
We have a ten year old son who is delayed in learning to ride a bike. We used a trail-a-bike for a few years, but he’s now outgrown that. The Boda Boda All-Terrain looked like a good option to resume our family bike rides with our other sons while our ten year old learns to ride himself and build his stamina. To our delight, the All-Terrain has been a great solution. Due to time constraints of a recent trip, I fitted a seat and handle bars I bought off Amazon to the All-Terrain for him to sit on the back and they worked well. He loves bike rides, and the bike is sturdy to carry his 85 pounds with no issues. 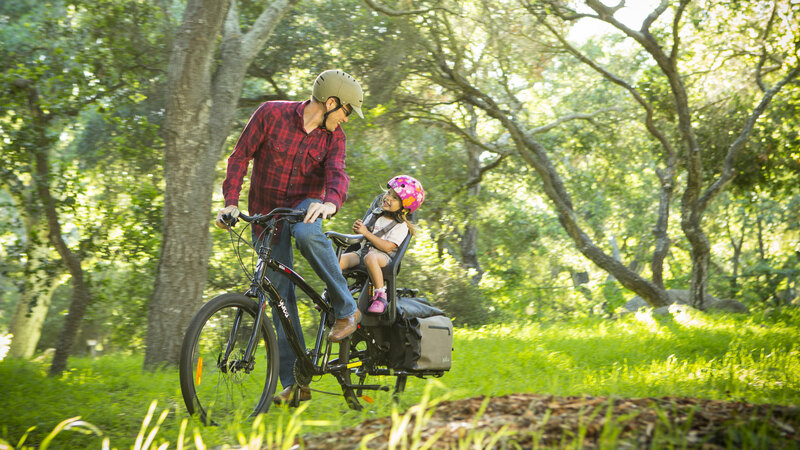 We have an excellent short term solution for bike rides now, and when he learns to ride his own bike, we can convert the All-Terrain to a grocery-getter or other use around town. I use my Boda Boda All-Terrain to take two infants to daycare, and haul family groceries. I look forward to riding it every day! 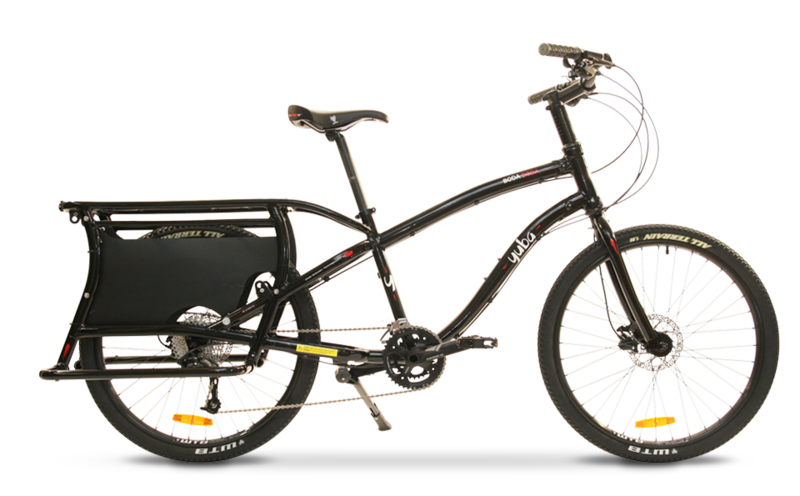 I like the short wheelbase compared to other cargo bikes, because it can be transported on a regular roof-mounted bike rack, and can easily be stored upright on a wall hook inside the home. I did experience some wiggly handling with an infant and a toddler on the back, even with the rigidly-connected Yepp seats. I’ve ridden a variety of bikes almost every day of my life so I don’t think it was due to a lack of riding ability. So I moved some weight forward by adding a Surly front rack, putting my manly satchel and formula bottles low down in front panniers, and changing out the handlebars (see below) and the wiggles disappeared. As a bike nerd there are many things I like about this bike–the 2×10 gearing and long chain mean you can use every gear without cross-chaining. The stiffness of the external bearing BB and the 1.5″ headset with added weld plates (and the welded rack) mean you can ride it quite hard without much flex, and the gearing is low enough for singletrack or for loaded touring. I have only two concerns—first, there’s only one eyelet on the front fork to attach a rack; this severely limits your rack options. Second, the stock handlebars have a very swept-back hand position that put me (5’11”, 58cm frame) in an upright sitting posture, which is not ideal with a heavy load on the rear. I changed them for a bar with a neutral hand position and more forward reach. 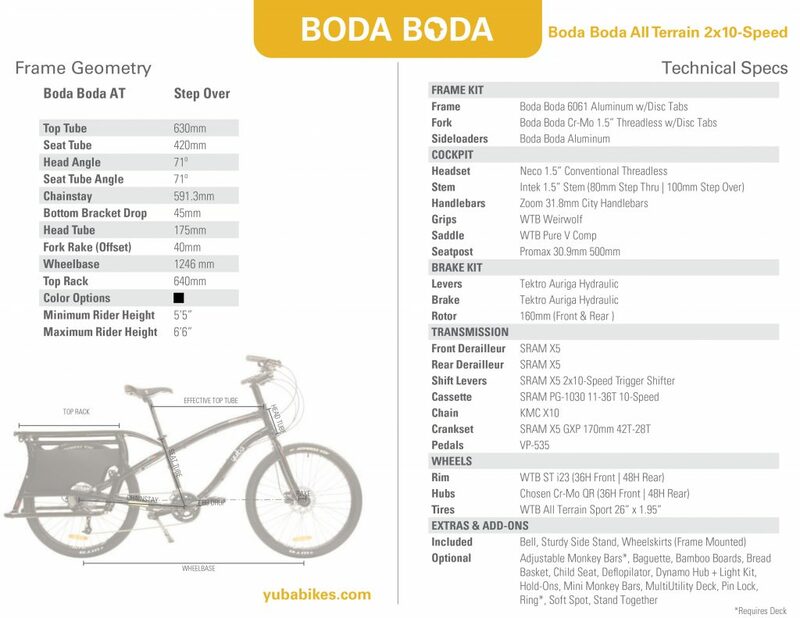 There are no eyelets for rear fenders, so you have to order special fenders from Yuba; they’re not (Jan 2018) listed on the website, so you have to call. 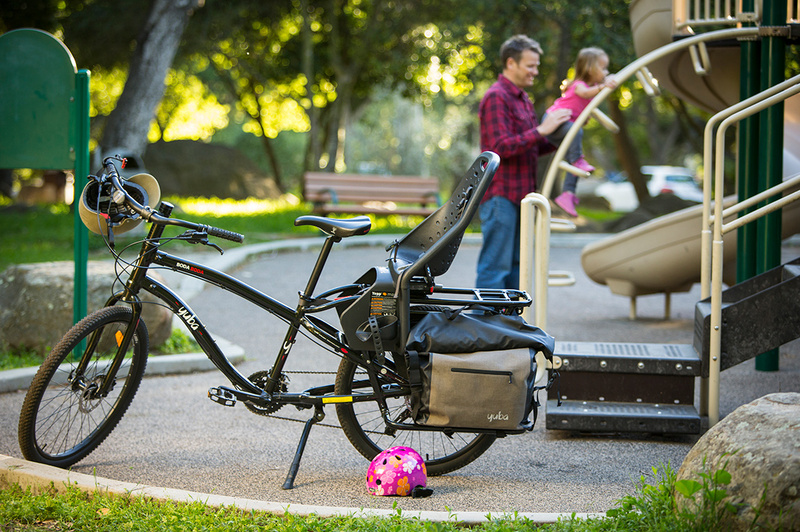 The stock single kickstand doesn’t support the bike under top-heavy loads, so for kids you’ll want to upgrade to the double kickstand and add the “deflopilator”. To absorb potholes, I changed to a 26×2.35 balloon tire—that’s about the max that manufacturers recommend on a 23mm rim. Love it! Great for bike commuting, holds all of my gear. Perfect for taking kids longer distances than they could safely bike themselves. 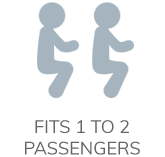 It feels stable with two kids onboard… Or an adult that doesn’t wiggle too much. I love my bike. I bought my Boda Boda All -Terrain e bike about a year ago and use it to take my son to school and pick him up everyday its faster than driving a car at those hours. No problems to reports and would recommend to anybody who needs to commute around town and can take a friend with you. The Boda Boda All-Terrain has been a great solution to my daily commuting needs in Washington, D.C. I have ridden it nearly every day for the past nine months, taking my son to school and then continuing on to work. I especially appreciate the stability of the bike with a passenger; my son routinely switches from facing forward, to the side, and then facing backward, without impacting my balance. When he wants to play with a pal, I can take both him and his buddy to a nearby park and the added weight hardly slows us down. I have found the Boda Boda All-Terrain to be a reliable friend and could not imagine our urban life without it!